Desolate, cold, inhospitable, relegated to the backyards of exploration and knowledge. Antarctica did not emerge from this unfortunate fate till less than 100 years ago, before which, whalers and seafarers were its only visitors. Cartographers barely acknowledged its presence (or chose to ignore it altogether). And the first explorations, which began in early 20th century, remained restricted to the enormous continent's fringes. It is the earth's final frontier. Antarctica, a gigantic mass of ocean-encased rocky islands south of the Antarctic Circle, is the earth's southern-most continent. There is no place colder or drier. Stark but majestic, uncompromisingly bleak but alluring, 98 per cent of the continent's 14 million kilometres (km) is sheathed in ice that is about 2,200 metres (m) thick on an average. 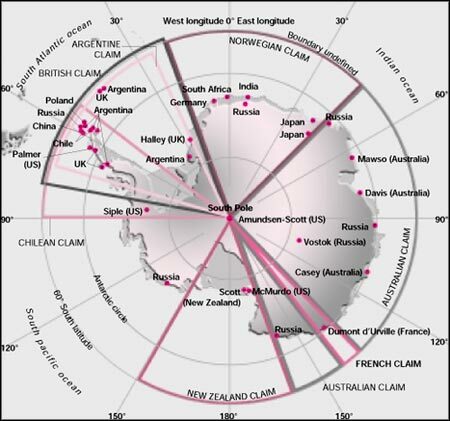 The South Pole lies near its centre. Temperatures hover below 0 and ice shelves dominate 11 per cent of its area. The waters around Antarctica complement the hostility of its terrain and climate: they are some of the stormiest in the world. The meeting ground for warm currents from the Pacific, Atlantic and Indian oceans and cold currents from the Antarctic, they form a remarkable oceanic boundary ranging to the 50th parallel known as the Antarctic Convergence. Mammoth icebergs rule the waters south of the Convergence, and sub-polar aquatic life thrives in them. Five times the size of India, Antarctica is asymmetrically divided by the 500-million-year old Trans-Antarctic Mountains into two sub-continents: East and West Antarctica. East Antarctica, a large Pre-Cambrian shield, was part of the ancient Gondwana landmass which existed a billion years ago. The landmass, which also included Africa, Australia, India and South America, broke apart about 65 million years ago. In comparison, West Antarctica is younger. It was assimilated over the last 500 million years by the addition of continental fragments called microplates. Four of these microplates have been identified: Ellsworth Mountains, Antarctic Peninsula, Marie Byrd Land and an unnamed block of igneous rocks and metamorphosed sediments. Of these, the 16,000-feet (ft) Ellsworth Mountains were formed 190 million years ago in the early Mesozoic era. The Andean Orogeny of late Mesozoic and early Cenozoic (about 60-80 million years ago) gave rise to the Antarctic Peninsula, which is made up of igneous rocks, volcanics and metamorphosed sediments. Though Antarctica is currently tectonically stable, recent volcanic rocks exist on Marie Byrd Land; west of the Trans-Antarctic Mountains lies the 3,794 m Mt Erebus, an active volcano. The Gondwana sedimentary beds in the Trans-Antarctic Mountains, along with the metamorphic rocks of the Antarctic Peninsula, house most of the continent's plant and animal fossils. While the Palaeozoic rocks of the Trans-Antarctic Mountains hold Permian age plant remains, the younger rocks have fossils of Triassic reptiles and amphibians -- all pointing to a past in which the continent enjoyed milder, life-sustaining conditions. In 1982, fossil remains of a 40 million-year-old marsupial were dug out from the Antarctic Peninsula. Fossils of primitive fresh water amphibians and reptiles -- labyrinthodonts and codonts -- have been unearthed about 640 km from the South Pole. Soil has no place in Antarctica's icy landscape. Soil cover -- extremely thin and patchy, alkaline and containing little or no humus -- is limited to just about 2-3 per cent of the continent's area. On the rest of the land, giant glaciers glide slowly towards the sea, into which they discharge immense flat-topped icebergs -- unique to Antarctica. Cold, arid deserts called 'dry valleys' or 'oases' dot the areas where glaciers have receded. Inland, the gently rolling surfaces of the ice cover, rugged mountains and nunataks (rocky outcrops) point to the nature of the sub-ice relief. On a hot June day in 1981 S Z Qasim, then environment secretary, reached out to answer a telephone. The caller was Indira Gandhi, the prime minister. The conversation was brief and to the point. "Can India reach Antarctica?" asked the prime minister. Qasim, who had only an academic knowledge of the continent in question, replied in the affirmative. A few months later, he found himself at the helm of a 21-member team, the first from this part of the world, on its way to Antarctica. Keen to avoid brickbats in case the expedition collapsed, but also as shrewd strategy, the government shrouded the project in secrecy. The expedition quietly embarked from Goa on December 6, 1981, floundered in the impenetrable pack ice that surrounds Antarctica, and finally landed on the coast after three botched attempts. Since then, Indian researchers have set foot on Antarctica 24 times, spent more than 70 days on its icy expanse, and frozen away approximately Rs 25 crore in just per-expedition costs. All kinds of scientists flock to 'The Ice' on the ice-breaker that leaves Indian shores every December to return in March-April. 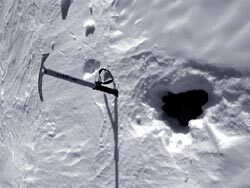 Since 1983-84, some members of the expedition team have been staying back in winter for experiments. Given this repetitive routine for more than 20 years now, it is time to take stock: what direction has our Antarctica research taken in these years? What has been its dnouement? What are the problems and inconsistencies that clog our research efforts? And what, if any, are the solutions? To begin answering these questions, we must ask ourselves another question: why Antarctica, of all places? The answer comes from P C Pandey, director of the Goa-based National Centre for Antarctic and Ocean Research (NCAOR). "When we started the Antarctica programme, the geopolitical question was certainly in the back of our minds, he says. Like all other nations in the fray, India did not want to be left out in the event of Antarctic resources coming up for grabs. Science followed: research was a way of maximising returns from the expedition investment. And Antarctica offered a proven rich laboratory. Says Geological Survey of India's (GSI) Anil Joshi, who has been to the continent twice: "Anything in Antarctica is like a unit preserved in ideal conditions." Points out Vinod Gaur, former secretary, department of ocean development (DOD): "The real reward of studying Antarctica is that it allows you to document baseline data, which is seminal for pushing up the limits of scientific research in any country." According to Pandey, understanding Antarctica's atmosphere seas and cryosphere could help India improve its climate prediction capabilities substantially. Given that the endeavour is now 22 expeditions old, the question may be asked: what has Indian research in Antarctica achieved? PLATE TECTONICS: As breakaway parts of Gondwanaland, Antarctica and India have a lot in common. 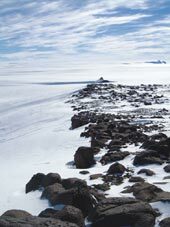 In fact, the rocks found in Antarctica's Schirmarcher Oasis (garnet-biotite gneisses, augen gneisses and quartzo-feldspathic gneisses) have been discovered to be similar in overall composition to those found in the granulite terrains of the Eastern Ghats and the khondalite belt of Kerala. 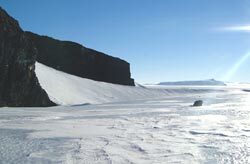 Antarctica holds the key to how, why and when the Gondwana landmass disintegrated. For India, this is of critical importance: as the Indian subcontinent moved away, it began colliding with the Eurasian plate resulting in the creation of the Himalayas. By studying and comparing the plate movements of India and Antarctica, Indian researchers are hoping to improve their knowledge of geological phenomena such as earthquakes. It can also give deeper insights to the response of the Indian Ocean floor near the east coast of India to such plate-driving mechanisms and help assess mineral resources and hydrocarbons. More importantly, a better understanding of East Antarctic geology could provide clues on a recent postulation that the Indian plate is a composite of four independent blocks which got welded together between 1600 and 500 million years ago. This theory, advanced by a team of earth scientists from GSI and Birbal Sahni Institute of Palaeobotany, Lucknow, is believed to be in a position to explain earthquake enigmas in central regions of India, long considered stable. GEOLOGICAL MAPPING: Geological mapping of the Antarctic terrain has been the focus of Indian geological studies in the continent. Till 2003, GSI had mapped 190 square km (from 15E to 6E longitude) on a scale of 1:500 and collected 2200 rock samples. The mapped areas have included the central Dronning Maud Land or cDML (the first-ever mapping of the region)the Schirmarcher Oasis and several sectors in the Wohlthat mountain chain. As a result of this, GSI published the first regional map of the Schirmarcher-Wohl area in 1991. Lying closer to India's east coast, the topography and rocks studied have helped scientists understand the links between Antarctica and India. MAGNETIC AND GRAVITY SURVEYS: Scientists from the National Geophysical Research Institute (NGRI), Hyderabad have conducted magnetic and gravity surveys in and around the Maitri station using indigenous gadgets. Essential for observing the earth's magnetic field and understanding local geology, these surveys included the first-ever helicopter-borne magnetic survey (by any country) during India's seventh expedition and an aerial gravity survey in the ninth. The first survey mapped the magnetic intensity over 100 square km between the Schirmarcher Oasis and the Wohlthat mountains and yielded, for the first time, the sub-glacial topography of the region. Helicopter-borne magnetic surveys are difficult exercises as 'electromagnetic noise' from the engine can affect the accuracy of the data. India, in fact, is the first country to have developed low-cost helicopter-borne magnetic survey equipment. NGRI has also set up a seismic station which records seismic activities in CDML and exchanges data with other nations. ICE CORE STUDIES: India has made a modest start in another significant area of research in Antarctica, the study of the continent's ice cores. GSI drills the cylindrical cores out of Antarctica's ice sheet: these cores, frozen archives which trap and hold atmospheric gases, can help them take a look at climatic records of the last 5000 years. Scientists believe that such ice cores can point to trends in global industrial pollution, climate change and ozone depletion; and eventually help devise ways to arrest them. 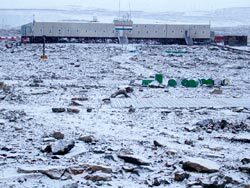 The project, however, has been largely hamstrung by lack of infrastructural support: Indian researchers have to use their trucks as cover in fierce blizzards, while other nations have built well-sheltered complexes around their drilling sites. As a result, India has managed to raise only 220 m of ice cores compared to 3.62 km raised by Russia-France-US' collaborative efforts at Vostok. The NCAOR is currently setting up a low temperature laboratory at Goa to preserve and analyse ice cores. GLACIAL STUDIES: Scientists believe the study of ice cores could also help them understand Himalayan glaciers. Glaciers in the Himalayas, much smaller than huge continental ice shelves in Antarcticaremain snow-covered round the year. According to S Z Qasim"A comparison between the Himalayan glaciers and those in Antarctica will provide the former's geological history. Hence, the studies on Antarctic glaciers can throw light on the differential nature of weather and climate of the two geographically distant zones. Despite being the lifeline of the Indian economy (as the feeder of all the rivers in the gangetic plains)Himalayan glaciers are little understood. Even meteorologists admit the influence of Himalayan glaciers on the all-important weather phenomenonthe south-west monsoonis yet to be comprehended completely. Will Antarctica help solve their mystery? AURORAL AND GEOSPACE STUDIES: The earth's polar regions are uniquely suited for the study of geospace -- critical to analyse what is called 'space weather'. Geomagnetic field lines emanating from the poles act like conducting wires for most of the electrical and magnetic fields and particle energy from the sun. Which means electromagnetic conditions in distant space can be mapped right down to the earth's atmosphere. The earth's auroral region, lying between 65 and 75 geomagnetic latitudes, is the area where this direct transfer of solar energy particles into the earth's near atmosphere occurs. Maitri, on the fringes of the auroral oval (a band of latitudes over which the geomagnetic activity occurs), is ideally placed to conduct auroral and geospace studies. The results can augment weather forecasting and space exploration capabilities. Scientists from the Indian Institute of Geomagnetism (IIG) Mumbai, have been studying the aurora australis (aurora in the southern hemisphere). According to former IIG scientist and Antarctica veteran Girija Rajaram, India has made rapid strides in geomagnetism studies during 1992-2001 by increasing the number of experiments in Antarctica from one to six. India was the only country in Antarctica to operate a Fluxgate Magnetometer Triangulation Experiment to estimate the velocities of drifting auroral current systems over Maitri. This experiment established the suitability of Maitri's location for assessing space weather. OZONE STUDIES: In 1985, a chance discovery of the 'ozone hole' over Antarctica by Britain's Joe Farman precipitated interest in the continent. Interestingly, India had commenced its ozone studies in Antarctica at least three years before Farman discovered the ozone hole. According to C R Sreedharan, former deputy director general of the India Meteorological Department (IMD) and the first Indian scientist to conduct ozone-related studies in Antarctica, the first Indian balloon-borne ozone-sonde, an equipment used for measuring vertical distribution of ozone, was sent up during the 1982-83 expedition. Five years later, Indian scientists installed a Dobson's spectrophotometer, a sophisticated equipment which can quantify total ozone over an area. India's early start in Antarctic ozone studies was due to the pioneering work by two scientists - K R Ramanathan, internationally known as 'Mr Ozone' and Anna Mani, who was instrumental in setting up a chain of Dobson's spectrophotometer observatories across the country. The New Delhi-based National Physical Laboratory has built on this (see box: The laser heterodyne system). STUDY OF MICROORGANISMS: Molecular scientists and microbiologists from the Hyderabad-based Centre for Cellular and Molecular Biology (CCMB) led by the centre's deputy director S Shivaji discovered 20 species of bacteria and other lower-order organisms. Some of these have been categorised and their metabolic activities at sub-zero temperatures recorded. One of the species, able to break down human faeces, has been tested for use in Siachen. The CCMB team has also developed a number of industrial technologies which could make use of many characteristics of these organisms. For example, says Shivaji, there are bacteria that can help in fermentation at room temperatures, thus negating the need for extra heat and saving on energy. STUDY OF LICHENS: The National Botanical Research Institute (NBRI), Lucknow, has concentrated on studying lichens, composite plants made up of fungi and algae. Sensitive to pollution, lichens can accumulate chemical pollutants and act as indicators of pollution in a particular area. "We have been monitoring heavy metal pollution by gathering lichens from nunataks (rocky outcrops) in the Schirmarcher Oasis every five years, says D K Upreti, who heads the lichenology laboratory at NBRI. According to an NBRI analysis, lichen samples collected from around the Russian station Novalazarevskaya revealed lead accumulation in them, while those from around Maitri were free of polluting heavy metals. The NBRI, jointly with the Birbal Sahni Institute of Palaeobotany, is analysing pollen spores trapped in lichen cushions to get an idea of the affinities of Antarctic biota with that of other nations'. Also, it has recently entered into collaboration with the St Petersburg (Russia)-based Komrev Botanical Institute to expand its studies. PSYCHOLOGICAL ADAPTATION STUDIES: Scientists from the Defence Research and Development Organisation and the All India Institute of Medical Sciences, New Delhi have conducted studies to understand the impacts of the extremely harsh Antarctic environment on Indian researchers working on the continent: changes in body weight, skin-fold thickness, heart rate, blood pressure, oral temperature, respiratory rate, basal metabolic rate, cold pressure response and physical fitness of wintering team members. Studies found that conditions in Antarctica completely disrupted the circadian rhythm -- the regular pattern of secretion of thyroid-stimulating hormones by the pituitary gland -- in the researchers' bodies. This led to some very unusual psychosomatic behaviour. Understanding how people behave in such hostile conditions is perceived to be of strategic importance to Indiaas it can help experts reach into the minds of Indian soldiers manning borders with China and Pakistanliving in extreme cold conditions and isolation from their families. METEOROLOGICAL STUDIES: Antarctica and the waters that surround it are the primary regulators of global climate. For instance, by feeding the Indian Ocean, the Antarctic Ocean is instrumental in influencing tropical monsoons. Scientists from the IMD, therefore, have been an integral part of all Indian expeditions to the continent. Baseline data collected by them over the years, they claim, can prove vital in future monsoons predictions. At first glance then, Indian research in Antarctica does seem formidable in its scale and scope: an assumption that receives ready support from scientist-bureaucrats such as Qasim. But how true and reliable is this assumption? A 1996 expert group report on the Indian Antarctic programme says: "The programme has so far been working in complete isolation with no substantial element of international cooperation. While actual attempts are being made by various countries through the aegis of SCAR (Scientific Committee on Antarctic Research) to join hands in experiments that need prolific logistic support, India is not represented in any of these international endeavours." The report also notes that "the participating institutions are sponsoring very junior scientists for the Antarctic expeditions. There are instances where technical assistants and research fellows with inept experience and background are deputed to Antarctica, as a consequence of which the quality of the work in the field suffers. The committee, therefore, feels that senior scientists who are directly involved in Antarctic research should find time to lead their teams to Antarctica so as to provide proper guidance and direction to the research teams working under them." While this report's observations and recommendations do carry an element of sanity with them, an evaluation of the Antarctic programme by the New Delhi-based National Council of Applied Economic Research (NCAER) in 2002-03 epitomises the skewed logic that seems to be characteristic of the Indian presence in Antarctica. The evaluation points out: "At present, there is an urgent need for consolidation of the work done in different spheres and reaching a certain level of research accomplishment comparable to international standards. In order to achieve this, the scientific data has to be collected on long-term basis. Hence DOD should insist for the commitment of participating institutions for long-term projects." So far, so good. But the NCAER evaluation goes on to say that "the functional approach is the predominant organisational structure". In other words, bureaucracy runs the programme. It then blatantly argues for non-original research. Approvingly, it says: "There is a commonality in scientific areas of research undertaken in various countries' programmes. This would discount the hypothesis of critics arguing that the 'imitative research' is a drain on country's valuable resources." The idea of international cooperative research floated here is obviously a bogey. "It is unlikely that the Indian government would adopt the consortium approach as this would require a totally different administrative structure to the one which is prevalent at the moment." Like the science, the evaluation of its achievements runs up against the same monolith. But this is not all. Although India has been admitted to both the Antarctic Treaty System and the SCAR in 1983 and 1984 respectively, it has made very little original and intellectual contribution at the meetings of these international bodies. This is because successive governments have chosen to completely neglect the issue of Indian representation at these events: while other nations have sent delegations of specialists, Indian presence has mostly ridden on a single member-team, which is hardly able to present the country's position forcefully. Also, in most cases, this assignment has been entrusted to career bureaucrats, who are usually clueless about Indian scientific work in Antarctica. Naturally, our researches in the continent have had very little global impact. Finances are also an issue. Allocation for Antarctic research has remained more or less static since the first expedition in 1981. In terms of activities and new experiments, there has not been any substantive scaling-up of research in the continent. Even the discussions on setting up of a second research station, a location for which is yet to be finalised, have been initiated only recently. Clearly then, there is absolutely no plan. The government does not know what it wants its scientists to do; it probably doesn't wish them to do anything at all. Even evaluative reports meant to break the impasse do not provide focus and vision, becoming a duller version of the same dullness that informs the Antarctic initiative. Concurs noted space scientist U R Rao, who was the chairperson of the expert group that prepared a 10-year work profile for the Indian Antarctic programme in 1996: "There is a need for sharpening our research focus." Says another scientist associated with the Antarctic programme from its early years, "We wanted to be there. So we went there for the first time in 1981. Since then, we have been going there every year -- more like a ritual." A ritual now perfected to an art. Is India's Antarctica science really an eye-wash -- more bureaucracy than science? One cannot, of course, deny the fact that India needs to keep that toehold. During the past three decades, Antarctica has moved towards the centre of the international stage due to a variety of reasons: its growing global environmental and scientific importance, its perceived resource potential, development of tourism and controversies regarding the most appropriate ways of managing its vast expanses. The continent has been discussed endlessly in the United Nations and in other international fora, attracted close personal attention of world leaders, and been the focus of interest of environmental groups and non-governmental organisations. During the early 1900s, Antarctica was beset by acrimonious territorial claims and counter-claims. While a polar tradition was the basis of some claims (as in the case of Chile and Argentina), a heroic history of polar exploration formed the foundation of Britain's emotionally charged claims. Sovereignty became a serious source of conflict. The signing of the Antarctic Treaty, a remarkable instrument that has kept various disparate interests together over the years, put a lid over this veritable Pandora's Box by freezing individual legal positions: claims were, thus, neither renounced nor diminished, but merely set aside for the duration of the treaty. Both the US and the USSR, in a Cold War year, had signed the treaty, so ensuring that Antarctica remained out of the purview of hostilities by declaring it a 'zone of peace'. Nations, however, continued to pursue their individual interests by using science. Traditionally, science was treated as a by-product of exploration or as a criterion for effective territorial occupation. Though the Antarctic Treaty pushed aside sovereignty concerns in the interests of international scientific cooperation, it reinforced the science-politics connection. For instance, it stipulated the performance of 'substantial research activity' as a precondition for future admissions to consultative party status. The level of scientific involvement, thus, became an exclusivist pointer to the territorial and policy clout of a nation. The treaty's claims to 'govern' Antarctica have set it against a phalanx of non-treaty nations who espouse that the continent is the "common heritage" of humankind. As a delegate from Zaire, a non-treaty nation at the UN First Committee in 1990 put it, Antarctica was "outside the jurisdiction of one country or group of countries and any wish expressed by any country either for its annexation or its exclusive control by a group of countries is nothing but an outdated imperialism". Indian involvement in Antarctica has to be viewed in the light of this history. As the second most populous country in the world, India believed that it did have a rightful place in the congress of nations that drove decisions in the region. Science happened, but almost incidentally. Says Swayamprabha Das, a senior programme officer with WWF-India, who has a PhD on impact of geopolitics on Antarctic environment, "What we really lack is a policy on Antarctica." Quite so. What we need, therefore, is a policy that gives Indian science its due place under the Antarctic sky. A policy that ensures that our annual Antarctic expeditions do not remain meaningless gestures. This is the only way our geopolitical ambitions in the region can be served. The NCAER evaluation of the Antarctic programme proposes long-term research commitment by institutions and widening the base of participating institutions to encourage competitive research. It also puts forth a vital suggestion: critical assessment of the work done by Indian Antarctic researchers -- not done till date -- and exploring the possibilities of application of the research. A paper presented by Rasik Ravindra and M J Beg of the GSI at a national conference on Antarctica research in Chandigarh in February 2003, says that India also needs to "graduate to international collaborative scientific programmes". India does have a few collaborative research programmes (for example with South Africa), but these are low-profile and have disparate objectives. Providing Indian Antarctic research a clear, application-based direction: our science and its custodians have a tough task on hand -- perhaps much tougher than what they undertake in Antarctica's extremely prohibitive conditions. Will they prove equal to it?